Remember back in days of yore, when Yahoo’s toolbars infested browsers, often multiple times, taking up valuable space, and the arcane uninstall procedures changed with the phase of the moon? Then Yahoo! got legit, and started showing up in the uninstall section of Control Panel. Well, to me right now, it looks like we are back to the bad old days. Two Vista laptops, which I support due to being a “computer guy” as well as familial and personal bonds of affection, have suddenly showed up with unwanted Yahoo Toolbars. One, with a 1280×800 screen, makes various kid’s games hard to play. The other with the even less vertically friendly 1368×768 resolution (who comes up with these numbers, anyway, and can we do something about them? ), becomes downright unusable for viewing, well, just about anything in the Firefox browser once it loses a half inch of content space to the Yahoo Toolbar monster. Happily thinking we are still in the new era of Yahoo legitimacy, I immediately exited Firefox, went to Control Panel->Programs and Features and removed Yahoo! Toolbar, then restarted Firefox. Hmm, still there. So, I rebooted (the universal WIndows fix). This is a little harder in Vista because the default Power Button and Shut Down actions are Suspend. Of course this is due to Vista’s inability to boot quickly, and possibly some misplaced confidence in Intel/Marvell/Broadcom/EverybodyElse hardware to actual recover from a suspend in a usable state, someone decided to make it a default, thus defeating (for the uninitiated) the ONE THING that fixes most Windows problems. Sadly, it fixed nothing. The toolbar is still there. Unamused, I decided to use Yahoo Search (really Bing, I know) to find the latest and greatest way to uninstall. I got the following answers. 2. Click the Pencil Icon and choose Uninstall (Fail- there is no Pencil Icon on the toolbar). 3. Go to Firefox Tools->AddOns->Extensions tabs and Disable or Uninstall the Yahoo extension (Fail- no extensions listed). Switching to a hopefully more unbiased Bing, I tried a few more searches hoping to find more information. More possibilities include hacking files in the Mozilla directory, install deleting/moving directories in the User’s Profile directory, or downloading some .exe with a very promising long name that sounds like it will do exactly what I want it to, and no more. Yeah, that choice went through the floor at the bottom of the list. This isn’t over. I WILL uninstall this unwanted crapware one way or another. I just wanted to document it for the world- Yahoo! badly behaved software, it’s back. 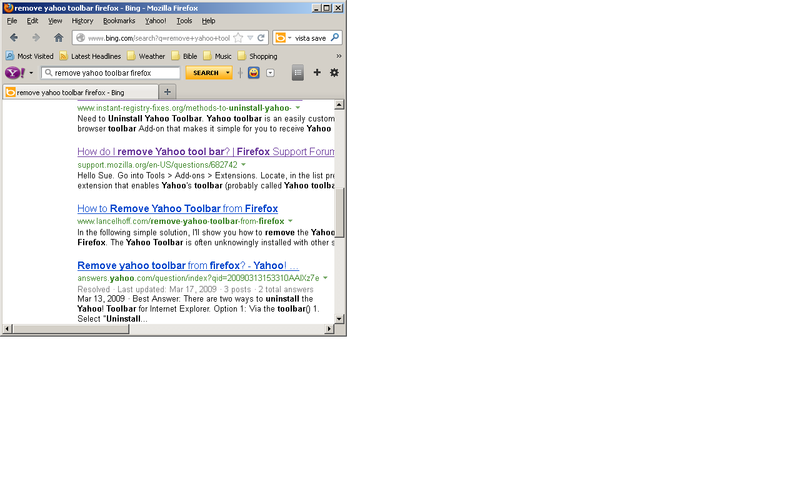 Firefox with Yahoo Toolbar after so-called Yahoo Toolbar Uninstall. Well, while checking out the laptop, I got one more A/V update, ran one more scan, a Full instead of a Quick scan this time, and the laptop came up with win32/hotbar. This is browser-based malware that pretends to be a legitimate toolbar extension, but pops up ads. Only this Firefox wasn’t popping up ads, and it had no Hotbar, only Yahoo! Toolbar. The A/V offered to remove win32/hotbar, so I let it. Suddenly Extensions were again available, and I could disable Yahoo! Toolbar. While this may seem to let Yahoo! off the hook, I still have several issues here. I disabled Yahoo! Toolbar… but I still can’t uninstall it. The uninstall is still gone. Apparently the uninstaller is not robust enough to actually delete anything while win32/hotbar is running the show. In addition it does not have any failure notification, it just fails silently. Finally, there’s the other Vista laptop, the one that has been running Messenger capably for half a year. It suddenly sprouted a Yahoo! Toolbar the same day as the infected laptop. 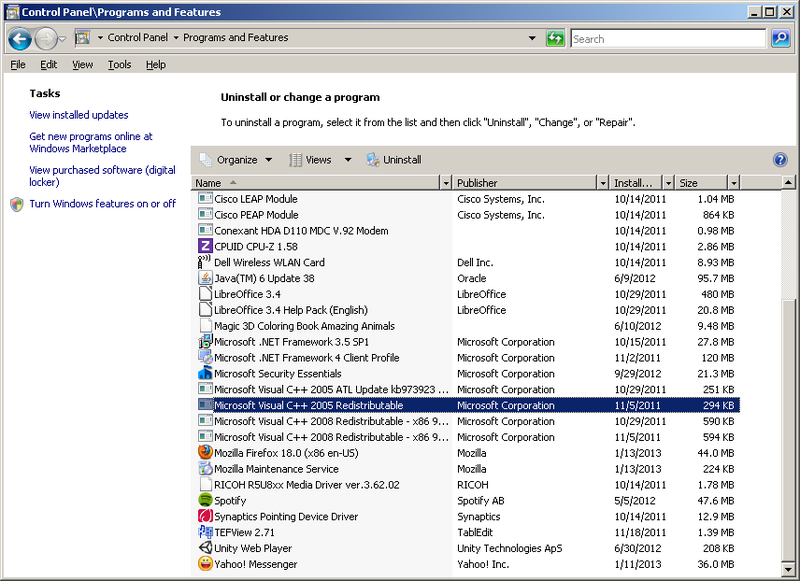 It came up clean for malware, and I was able to disable it from Extensions without incident. But why did it suddenly show up in Firefox?